Home to Liberty State Park, the iconic Colgate Clock and some of the most anticipated art and culinary projects in the tri-State area, today's Jersey City has shed its industrial identity and now oozes collaborative vibrancy. New Yorkers especially will find it easy to take the Path train just one or two stops (from Lower Manhattan) to experience inventive food, a one million square foot Kibbutz-like Art Storage/Exhibit/Workspace and that incomparable view. Here are 10 reasons that art and culture connoisseurs should head to Jersey City now. (For more in-depth information about Jersey City and other offbeat escapes in the Northeast, check out GetawayMavens.com). 1. The View. People who live in Manhattan, can't see the skyline through the skyscrapers. Even if you just pop over for an hour or so, the panoramic view of lower Manhattan from a few hundred yards away is up there with the World's Wonders. 2. The Clock. Yes, we all love bright, big neon signs. Especially if they remind us of our simpler, factories-on-the-waterfront times. 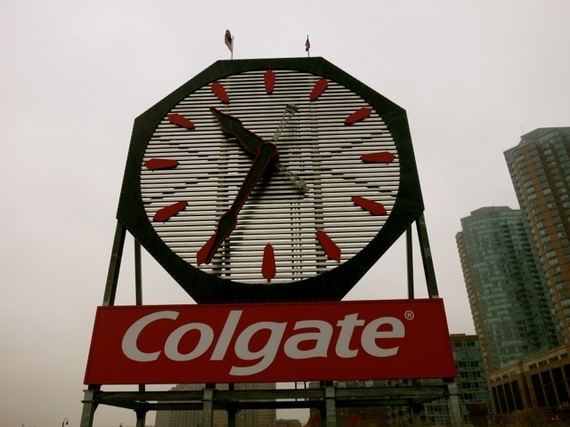 The Colgate Palmolive clock kept time atop the Colgate Palmolive factory from 1923 until the building was demolished in the '90s. Now, the clock sits on a pier next to ferries and the Hyatt -- a great photo op. 3. The Empty Sky Memorial at Liberty State Park. 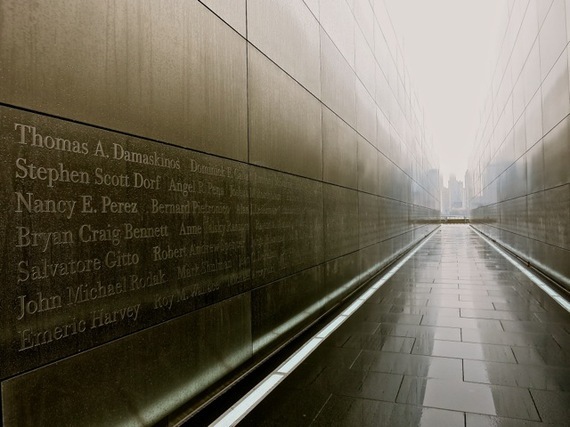 Two 210-foot long brushed steel rectangular slabs, lying on their sides and inscribed with the names of 749 victims of 9-11 from NJ, represent the fallen World Trade Towers. Look through the monument and you can almost see them -- an optical illusion that places the towers back into the skyline, like phantoms. 4. Mana Contemporary. A brand new concept, championed by two Israeli guys, Moishe Mana and Eugene Lamey, who brought Moishe's Moving to New York, the million square-foot Mana Contemporary (soon to be doubling in space) it is relatively unknown but gaining traction as an art powerhouse. A self-contained networking community for the performing and fine arts, it's basically a terrarium for artists and those who work with them. Armitage Gone! Dance has moved in, ICP (International Center of Photography) is moving their archives here in 2015, and the Richard Meier Architectural Model Museum is on site. Collectors can exhibit their art in huge museum-like galleries, meet artists who work in studios upstairs, and all can use the shipping, crating, storing and framing done in the vast building. The whole kit and caboodle is open to the public for tours during the week and on select Open Studio Sundays. 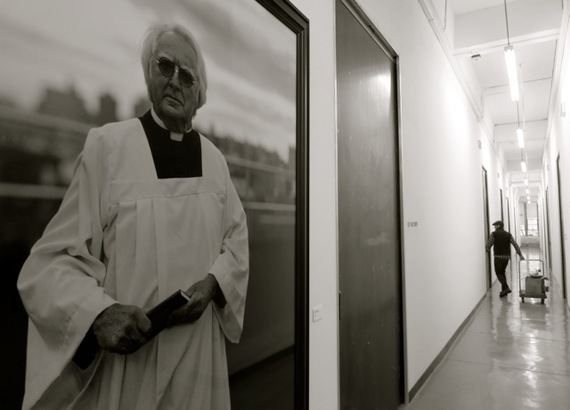 Guided tours, Monday - Friday are free. 5. Landmark Lowes Theater. Called "The most lavish Temple of Entertainment in New Jersey" when it opened in 1929, The Lowes hosted all the preeminent stars of the day. Burns and Allen, Bob Hope, Judy Garland, Cab Calloway, Jean Harlow and more graced its boards before the Landmark Lowes fell on hard times and descended into rats nest shambles. 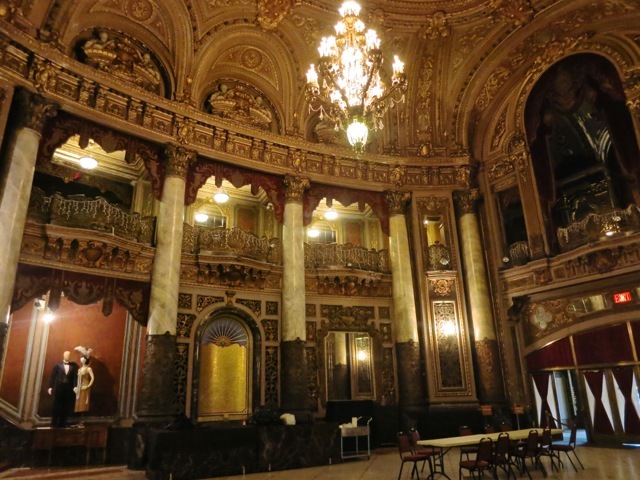 Now in the process of being restored, walk into the lobby, and its opulent beauty will stun you. The theater still houses its original light board and an intricate organ, identical to the one that played during silent films in the '30s. Call for tours. 6. ModCup. Did you know that 99 percent of all coffee served is either stale, burnt or both? This is the philosophy of ModCup founders, Justin Hicks and Travas Clifton, who began their coffee company with "one simple cart" in May 2013. "Coffee is one of the most complex fruits known to man," says Clifton. "The coffee 'bean' is actually a seed with 1,200 chemical compounds." 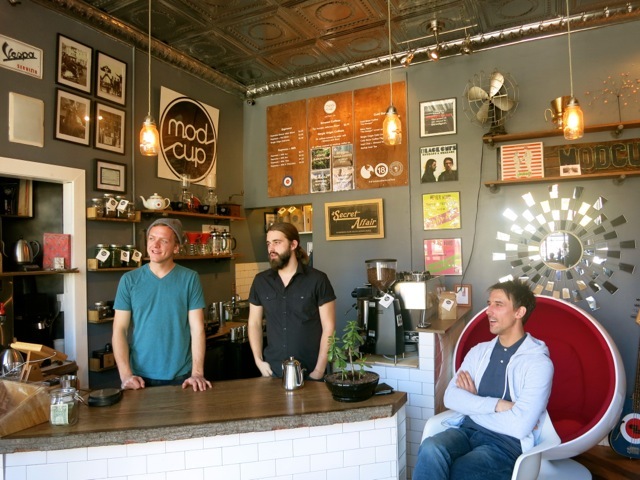 ModCup, which roasts its specially sourced beans and sells to area restaurants and is quickly expanding, uses only fresh beans, does not roast to a crisp, and will only make coffee with beans up to two weeks after roasting. "After 14 days, coffee beans go stale. Most people have been doing it all wrong." 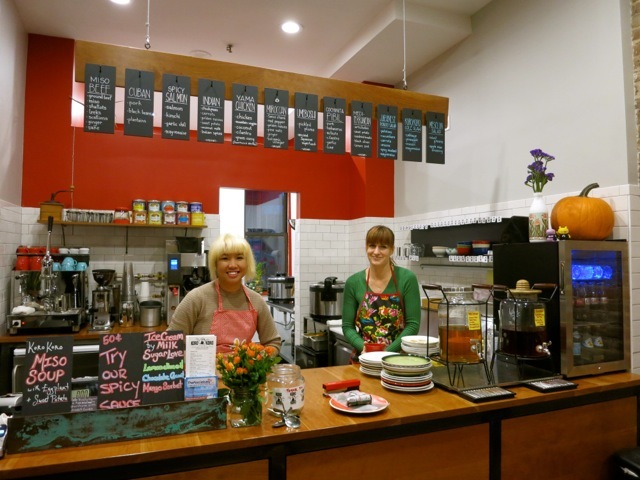 Come into their storefront on Palisade Ave. for a cup and you'll be a "fresh coffee" convert. 7. Razza Pizza Artigianale. I've never met a man so euphoric, so PhD scholarly, about yeast and bread as Dan Richer, owner of the Jersey City pizza joint, Razza. 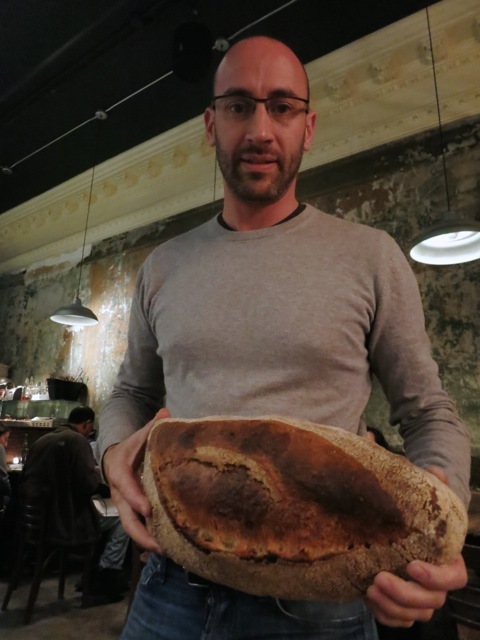 He has a habit of carrying around a tub of warm, frothy dough to showcase his proprietary yeast blend, revealing his passionate obsession with all things naturally leavened. Passion, of course, doesn't always translate into excellence. But in this case it does. The pizza is just as toothsome as the loaves of rustic wheat and rye that Dan bakes daily (only 18 loaves a day for now), and rivals the best pies in the world. 8. Union Republic. The name Union Republic emerges from a "collective, community effort," says owner Noah Sexton, which seems to be the prevailing ethos of Jersey City. Sit on Herman Miller chairs in a mid-century modern space while nibbling on treats from the kitchen of Chef Gregory Torrech. Newfangled concoctions are served on slabs of black slate: "Chicken and Waffles" -- confit of chicken deep fried with foie gras butter and Concord grape jelly, "A Hen Full"-- chicken meatballs in Dashi and Shoyu Broth, "Alpha and Omega" -- wild mushrooms with brazed greens, and the ever popular ramen BBQ burger. Bliss. 9. The Kitchen at Grove Station. 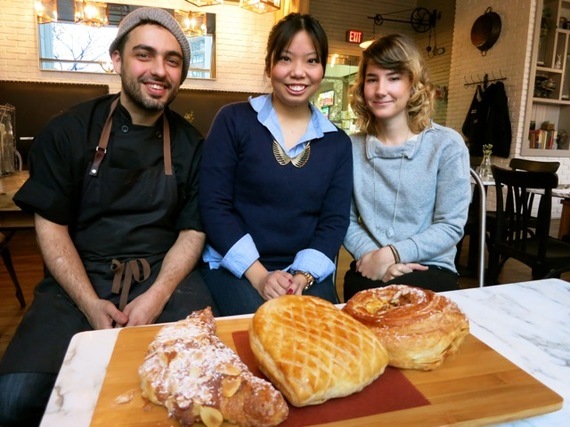 Three young 'uns have collaborated to turn this former cafeteria-type eatery into a destination restaurant. GM Tammy Tiongson (business brain), creative director, Rebecca Johnson (visionary), and Chef Dave Viana (artist of stove and plate), have teamed up and opened what is fast becoming a Jersey City hotspot. Try the stupendous Sweet and Sour Lentil Salad ($9), a colorful concoction topped with bright purple cauliflower, Butternut Squash Soup ("Thanksgiving in a cup"), and the fantastic "Kitchen Burger" -- in the cool Adirondacks meets French Bistro designed space. This Kitchen is destined for greatness. 10. Koro Koro. Carrie Grosso and Vincenzo Bove have perfected the art of the sticky rice ball -- aka, onigiri -- a Japanese comfort food here done ten ways. Purchase these sweet triangles of deliciousness, wrapped in seaweed, at their tiny storefront. Spicy Salmon with Kimchee and Cuban Pork with Black Beans are the most requested. Just $3.25 a pop. Future Top 10? It can't be included on this list quite yet, but here's another collaboration for the Age of Reality TV: Talde and Carrino Provisions. 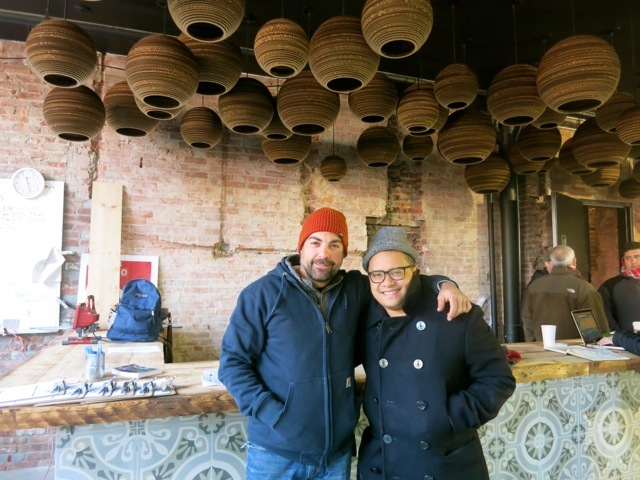 Dale Talde, darling, but never the winner, of Top Chef, and Anthony Carrino, star of HGTV's "Kitchen Cousins," have bro'd up to open a unique Italian Provision Shop/Asian American Restaurant in a repurposed NJ-NJ Bell switching station turned Jersey City Police Headquarters. 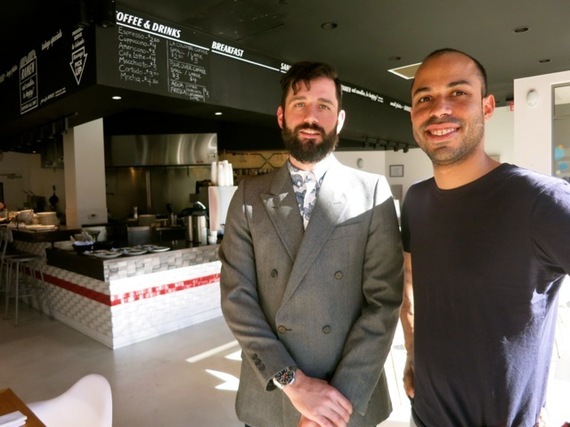 Talde, who runs a Brooklyn restaurant of the same name, interprets World food through a pop-American lens and also plans to do Dim Sum brunches and dinners on weekends in this soon to open 168-seat restaurant. As you can imagine, with kitchen designer Carrino as partner, the space is eclectic as all get out: Old School Italian Market meets Night at the Kasbah exotic. With all this eating and exploring, chances are you'll want to stay overnight. Do so at the Hyatt Jersey City. 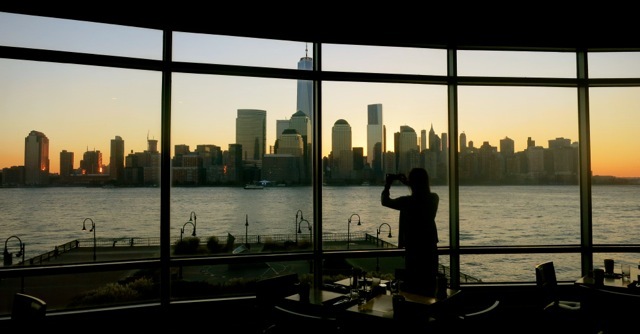 Right on the Hudson River, views from its restaurant, Vue, are unparalleled.